The new Richmond restaurant is a living museum for American comfort dishes, but these reinterpreted classics could use more oomph. 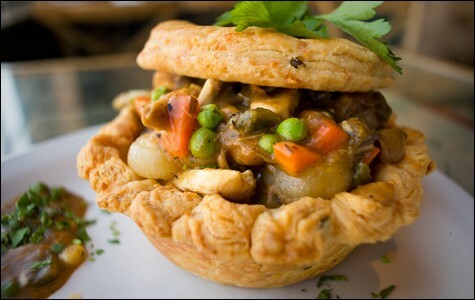 The chicken pot pie was presented as a velvety chicken soup inside a cheddar crust "bowl." Hours: Wed.-Sat. 11:30 a.m.-9 p.m., Sun.-Tue. 11:30 a.m.-2:30 p.m., Sat.-Sun. 10:30 a.m.-2:30 p.m.
Richard Mazzera and Terumi Shibata-Mazzera clearly have history on their mind. When the husband and wife decided to take over the Richmond waterfront restaurant BoilerHouse, rebranding it as Assemble, it was partly because they loved that the restaurant is located in what was once the boiler room of an old Ford auto plant, where jeeps and tanks were assembled during World War II. (The rest of the plant now houses the Craneway Pavilion, a 45,000-square-foot event venue that shares Assemble's kitchen.) The restaurant's industrial-chic decor pays tribute to this history, with huge pieces of vintage-era machinery preserved all around the room. It's fitting, then, that the Mazzeras have reconceptualized the restaurant as a kind of living museum for classic American dishes. Mac 'n' cheese is listed on the menu with a blurb about how Thomas Jefferson served the dish at a state dinner. An old-fashioned beef stew was inspired by a Dwight Eisenhower recipe. And, as an homage to San Francisco of yore, there's a wedge salad served with green goddess dressing (with a hat tip to the dressing's genesis at San Francisco's Palace Hotel). All in all, it's a neat wrinkle to the well-worn theme of reinvented comfort food — and you could scarcely imagine a team with a better pedigree: Mazzera, a Chez Panisse alum, is co-owner of the Berkeley tapas joint César. Shibata-Mazzera used to manage Trattoria Corso. And Maggie Pond, César's longtime chef, has been brought on to head the kitchen. What's more, when it comes out on the plate, much of the food looks amazing, in an elegantly down-home kind of way. For instance, Assemble's version of Frito pie is served in a torn-open Frito bag as is traditional. The dish consists of corn chips layered with beef chili, shredded cheese, pickled jalapenos, and sour cream — it's a junk food lover's dream, with Chez Panisse-style sourcing to alleviate any guilt. But in the end it was just ... fine. I liked that the chips retained their crunch, and you can't go wrong with the combo of chili and sour cream. But the problem was that the chili itself was bland — no heat, no detectable spice beyond salt. Other items followed a similar pattern: Menu descriptions sounded fantastic, the food looked great on the plate, and everything was executed skillfully enough. But many of the dishes were strangely timid in the flavor department. The cheesesteak was basically a roast beef sandwich served with house-made cheese "Whiz." But while the beef was admirably tender, it was also very, very bland — as were the sautéed peppers and onions on top. It was as though the chefs had set about creating a health-food version of the dish, stripped of all its oozy, fatty glory. Likewise, the accompanying hand-cut steak fries — literally a large potato cut into eight wedges and then fried — looked wonderful, but had hardly been seasoned at all. And the reinterpreted triple-decker club sandwich consisted of a single stroke of brilliance — a runny fried egg added to the top layer — that was wasted among a myriad of ho-hum components: generic-tasting sliced turkey, overly chewy bacon, and — the worst culprit — incredibly dry grilled chicken breast. Still, there were enough good dishes over the course of two visits to give me hope that the kitchen will eventually hit its stride. It turns out that one thing Assemble does really well is soups: The best of the starters was the New England-style clam chowder, which substitutes a rich shellfish broth for the flour- or cornstarch-thickened soup base that's typical of the style and includes a generous portion of fresh clams in their shells. It was a textbook example of how to update a classic dish while staying true to its spirit. The gumbo featured an abundance of Andouille sausage; plump gulf shrimp; a bone-in chicken thigh; big strips of roasted poblano chile; and plenty of that wonderful smoky, soupy quality I look for in the dish. Still, as adopted New Orleanian Emeril Lagasse would say, I still wished the kitchen would "kick it up a notch" — the shrimp and chicken, in particular, were under-seasoned. 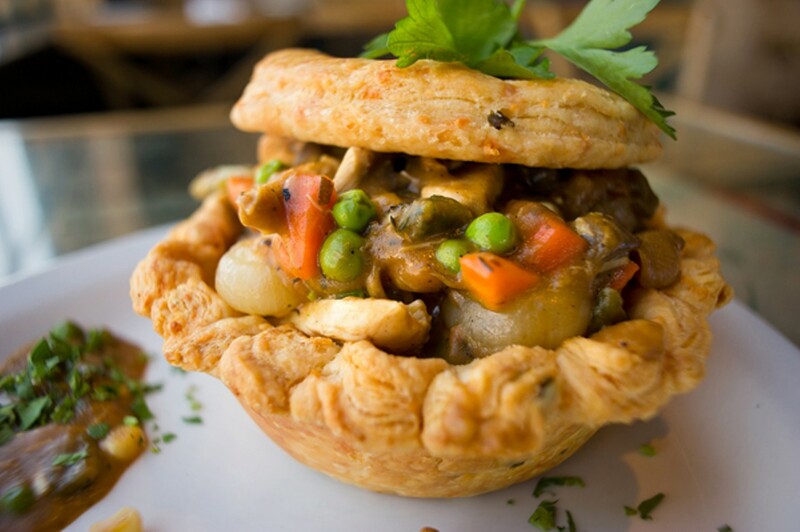 My favorite dish was the chicken pot pie, which was presented as a velvety chicken soup served inside a cheddar-crust "bowl" (like a cross between a biscuit and a gougère) — everything cooked and assembled to order. Here's a case where premium ingredients really make a difference: sweet kernels of white corn; thick shreds of tender chicken; and meaty, full-flavored chanterelle mushrooms. At first, it seemed to lack the slightly soggy quality I love in a traditional pot pie, but all I needed to do was dig into the bottom crust to get the same effect. It's worth noting that, two months after its launch, Assemble is still in soft-opening mode — as of this printing, there isn't any indication on the restaurant's website that it has already opened. And the Mazzeras' plans for the place are exciting: outdoor seating, a World War II-style Victory Garden, a raw bar, and outdoor grilling and smoking of meats. They also want to add a small section of tables inside the adjacent Craneway Pavilion so that customers will be able to enjoy spectacular panoramic views of the bay — not just the little sliver of water you can see from the restaurant right now. But here's to hoping that the chefs will work on adding bolder flavors, so that more of the food stands up to the loveliness of the setting.